Thank you so much for your input regarding my extreme backlog. I really appreciate the comments. If you haven't already, you can still voice your preferences! Today we begin a short trip to Carmel because a number of in-real-life friends have asked for it. Apologies to my cyberpals, but requests in the flesh are given more weight. Carmel is a sleepy little town. There is not much to do. There are lots of art galleries, golf courses, and the beach. That's about it. It's beautiful, but it's sort of boring, and things cost a lot more than they should. What do you expect from a haven for rich retired folk? Case in point -- our "hotel." I use quotation marks because it was much more like a motel. 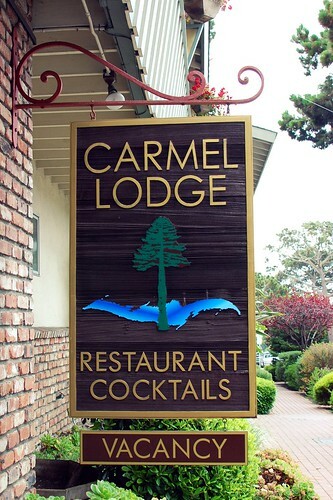 The Carmel Lodge looks decent online, but don't believe the charade. You know when a place calls itself "charming," it's really kind of a dump. This is the only picture you get. Our room was probably awesome...back in the '70s. Nevertheless, for $63 per night (via Hotwire), it was bearable in the twenty-first century. I wouldn't pay a penny more. To Carmel Lodge's credit, its location is fantastic. We walked to all the restaurants that I'll be featuring on the blog this week, as well as to the beach. And at least we didn't break the bank with our digs. This left plenty of money for food. 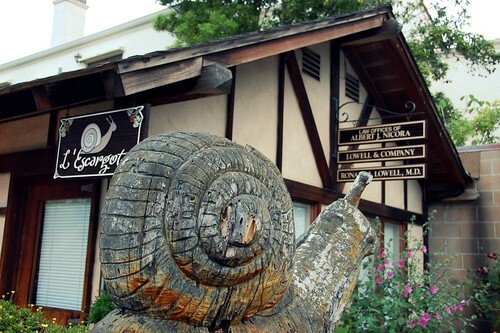 We had our first meal in Carmel at L'Escargot. Now this was truly charming. It felt like a fairytale. This was a cottage straight from Hansel and Gretel or Little Red Riding Hood. 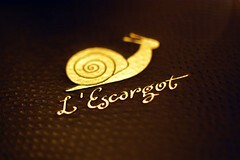 Small, cozy, and inviting, L'Escargot did not disappoint. The service was so warm and friendly. We each opted for the $36 prix fixe three-course dinner. This was a steal, given that entrees alone range from $17 to $38. I highly recommend this deal. Everything a French onion soup should be. Beefy broth, lots of bubbly cheese, and melt-in-your-mouth slightly-sweet onions. 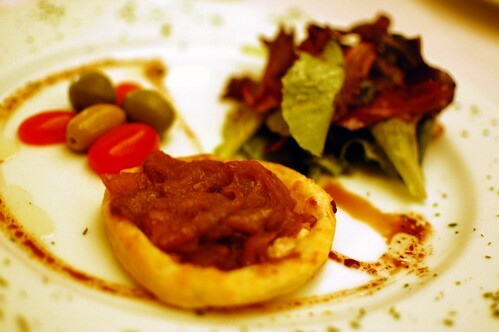 Caramelized onion and Sonoma goat cheese tart. The perfect finger food. My God, that goat cheese flavor. Ohhh. 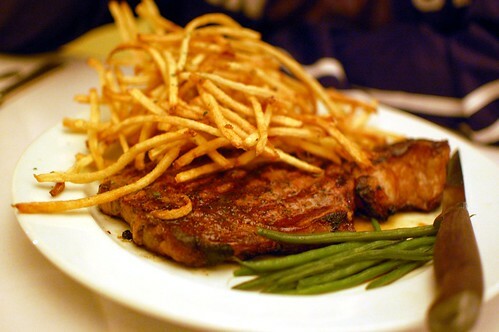 Ribeye steak with truffle butter and pommes frites. An amazing piece of meat with even more amazing fries. Mr. Monkey just looked over my shoulder and said, "I remember that. That was a good dinner." 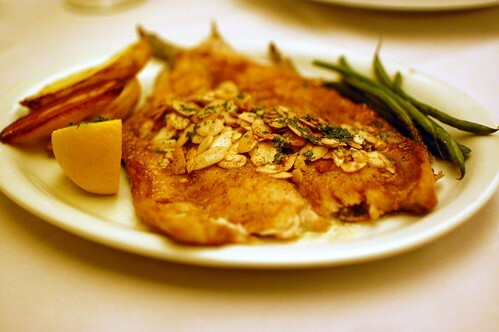 Fresh fish of the day -- trout amandine. I didn't think it was possible, but I enjoyed my fish even more than Mr. Monkey's steak. So buttery. So substantial yet delicate. 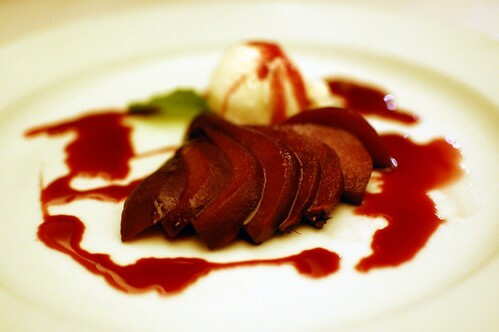 Poached Bosc pear with vanilla ice cream and Merlot syrup. Also simple and enjoyable. Flaky happiness. L'Escargot was such a find. 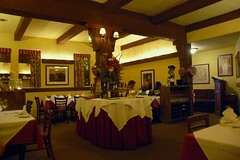 If you're looking for an affordable delicious meal in Carmel, consider this Country French gem. Because I am an only child and need attention and don't often follow directions, I'd like to put in my vote for a blog post about #6, Yellowstone and Montana. I am dying to go and would love to read about your trip. Sorry about your crappy digs. I totally stayed at that "hotel" about 10 years ago - too funny! but, sadly, we did not eat at 'lescargot. I do remember the beach having really nice sand for being on the pacific side though. that counts for something, no? Delicious! I love Carmel too. I agree with Jen. 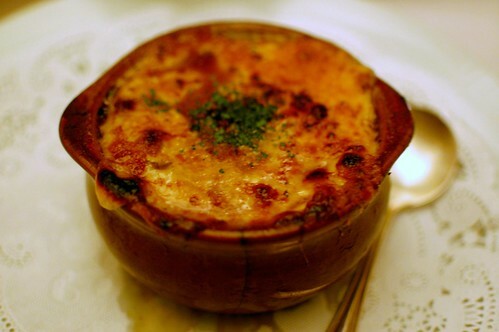 I love French Onion Soup! I always think it's funny when we go to the same place and have different experiences! Borrow a dog the next time you go. Carmel is the perfect weekend getaway for humans in love with their pups! Poached pears might be one of my favorite desserts and it's ridiculously easy to make at home, too. It all looks delish! What a disappointment for the hotel. I've thought about going to Carmel as a part of a California trip but your review has changed my mind. I know I asked for Vancouver on your "what do you want" post, but I'm excited you decided to post these. The husband decided to use up some free hotel nights so we're heading up this weekend. 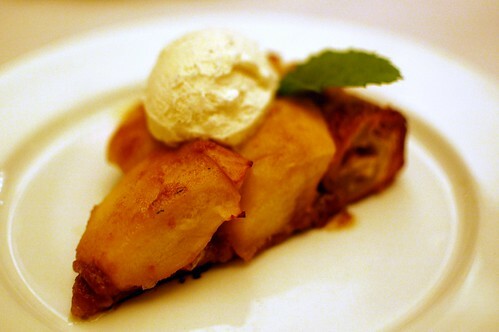 Hopefully, we'll get to try some of this yummy-ness.